Jink & Diddle is a total immersion Scottish musical experience! 90-minute dance class daily (Monday to Thursday) at which participants are invited to play, if they will not dance! the opportunity to dance at or play for a full dance programme. a 60-minute dance class daily at which participants are invited to play, if they will not dance! Some say it's not just playing the notes but playing the spaces between the notes. Others say it's like playing by ear from sheet music. Classes in both Scottish Country Dancing and in Playing for SCD provide all Week 1 participants (as well as relatives and friends) with the opportunity to take part in the Lighted Hall Scottish Country Dance Ball on Friday evening. At the end of Week 2, we have a dance followed by a ceilidh on Thursday night. The Week 1 ceilidh is on Saturday night. After hours impromptu playing erupts spontaneously - but the only residential building in which that is allowed is the Mission House - as a courtesy to those who need their beauty sleep! There are ample non-residential playing spaces available, however. Week 2 is a much less structured experience. Ye Auld Jink, as we call it, reflects the days when Jink & Diddle was in its infancy and John Turner was the only instructor. Everything is scaled back accordingly. The week is much less intense and the number of attendees is limited by the capacity of the Mission House on lower campus, where Jink & Diddle began. All classes are also scheduled on lower campus, in the Apple Barn, during Week 2. ... EAT, sleep and breathe Scottish fiddle? Despite the packed schedule during Week 1, it is really up to the individual to set his/her own pace at Jink, no matter which session one attends. Some people attend the group classes and private lessons, but spend the rest of the time relaxing or exploring the local area. 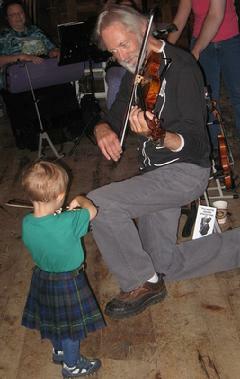 Others find the Jink & Diddle experience so enthralling that they want to eat, sleep and breathe Scottish fiddle. Those are the participants who HAVE to attend everything that is offered - and even get upset when multiple classes are offered simultaneously! Although Jink & Diddle is primarily for fiddlers and violinists, anyone interested in performing Scottish fiddle tunes on viola, cello, flute, recorder, mandolin or other similar melody instrument is welcome to attend. Past years have included viola, flute, cello, cittern, guitar, oboe, accordion, double bass viol, harpsichord, harp ... and the list goes on. We accept and cater to participants of all ages (under 12 must be accompanied) and all ability levels - from beginners to professional musicians. 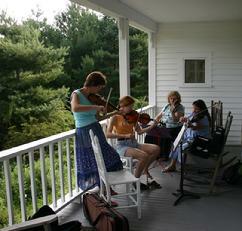 Attendees usually devote themselves to a single instrument during classes and practice hours. The great Scottish fiddlers of the 18th century could read and write music and participants should be prepared to do so too. Each year we feature the tunes of one eighteenth century composer among our music sources which will include other traditional and contemporary resources. Bring your own instrument and music stand. Be prepared for a lot of sight reading. It is not unusual for the Jink & Diddle classes to cover 40 or more tunes in a week. Music downloads will be available in advance from this site to those who register. The Scottish dance music alone - used for the Friday evening Lighted Hall Scottish Country Dance Ball - usually includes more than 40 tunes. Other sources in past years have included the works of Niel Gow, Daniel Dow, Robert Mackintosh, William Marshall, Capt. Simon Fraser, Robert Petrie and many others. Participants are welcome to bring their own music to use in private lessons and to share for impromptu playing. Please bring several copies, if you can, in the latter case! If you are interested in hearing the sounds of Jink & Diddle, they were captured on the CDs "Hale Be Your Fiddle" and "Highland Summer Storm." Attire is informal to suit the July/August weather in the North Carolina mountains - shorts and Ts work most of the time, but sometimes it gets a bit cooler. There can be dense morning fog which usually lifts by 8 or 9 am but you will want to bring jeans and a fleece at the very least. Bring your kilt (if you have one) for the ceilidh and ball (ladies, the ball is semi-formal) - but otherwise casual and comfortable is the order of the day. The hardy might want to bring a swimsuit. A short hike upward from Bishop Johnson Hall will bring you to a pretty waterfall that calls like a siren to the young - and the young at heart. Even with three group classes daily plus a private lesson, workshops and dancing, participants at Jink find ample opportunity to play together informally in the Barn or on the porches. 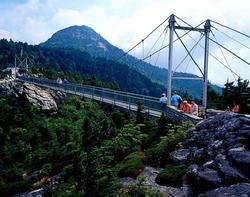 Some will go sightseeing in nearby Boone, Banner Elk or Blowing Rock; or visit the Mast General Store in Valle Crucis; while others will hike in this scenic mountain resort area or even join the tourist trail at Grandfather Mountain and the Mile High Swinging Bridge. Ceilidh night - and a Scottish Country Dance with a difference!